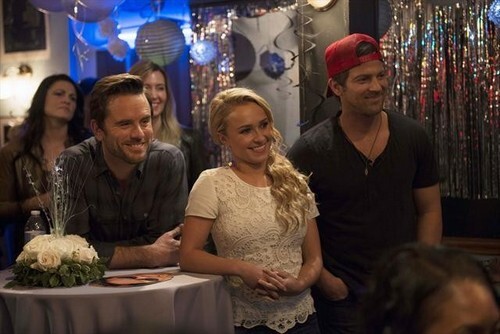 NASHVILLE returns to ABC tonight with a new episode called, “Dear Brother.” On tonight’s show real-life music stars Dan Auerbach of The Black Eyed Keys, Vince Gill, Pam Tillis, Rip Moore and Kate York attend Deacon’s surprise party. Did you watch last week’s episode? We did and we recapped it here for you! On last week’s show Rayna found comfort in the arms of an old friend after revealing to Daphne and Maddie her plans to divorce. Juliette is invigorated by the response to her new sound and took steps to reinvent herself — against the guidance of her management. Things are looking up for Scarlett and Gunnar when Rayna makes an offer to sign them to her label. While their hard work begins to show signs of success, Avery struggles to find his old sound and is forced to consider an attractive offer. On tonight’s show Juliette plans a surprise birthday party for Deacon, which is attended by real-life country stars Dan Auerbach (The Black Keys), Vince Gill, Pam Tillis, Kate York and Kip Moore. During the celebration, Rayna sings, backed up by Pam Tillis and Kate York as themselves, Watty White (JD Souther) and Adria (Erin McCarley). However, Juliette’s own performance is derailed by her mother. As Rayna and Teddy’s divorce moves forward, the tabloids move in, speculating about Rayna’s cheating and thrusting her children into the spotlight; Teddy decides to bring Peggy into his mayoral fold and holds a press conference to make it look like it’s all business; and Gunnar’s brother charms Scarlett with his singing. Guest starring Vince Gill, Pam Tillis, Dan Auerbach, Kip Moore, Kate York as themselves, Kimberly Williams-Paisley as Peggy Kenter, Judith Hoag as Tandy Conrad, JD Souther as Watty White, Sylvia Jefferies as Jolene Barnes, Maisy Stella as Daphne, Lennon Stella as Maddie, David Alford as Bucky, David Clayton Rogers as Jason, Kourtney Hansen as Emily, Erin McCarley as Adria and Marcus Lewis as Joe the Bouncer. Tonight’s show begins with Rayna trying to cope with her impending divorce from Teddy. She goes to the grocery store with her girls and finds that she’s tabloid cover fodder. Meanwhile Juliette is trying to plan the perfect birthday party for Deacon. She rolls up to Scarlett and asks for her to help get Deacon to the party. In return for the favor she’ll let Scarlett open up for her. Rayna sits down with her advisers and attorney and is grilled about her behavior during her marriage to Teddy. Specifically they want to know if she slept with Deacon. She refuses to answer but they demand that she not be photographed with him in public. Rayna’s phone is of course ringing non-stop and Teddy tells Peggy they should keep their distance, but he doesn’t want to. 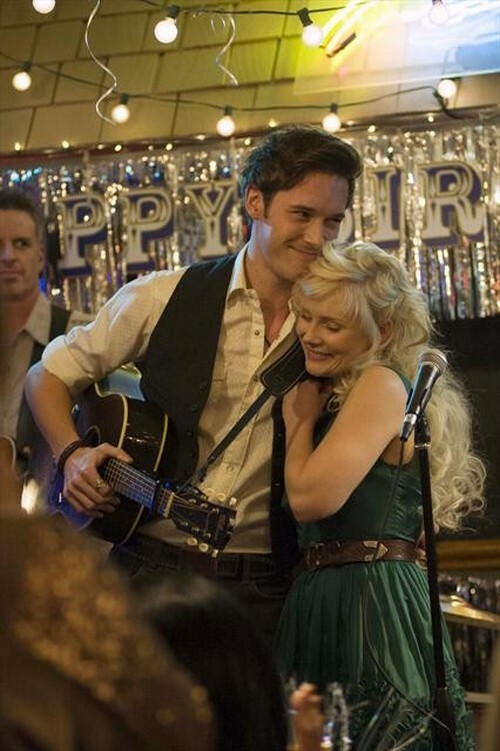 Scarlett gets Deacon to come to his party by inviting him to her gig. 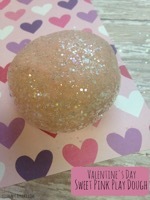 She arrives at his door step with a birthday cupcake as well as the invite. Rayna is at home watching Teddy’s press conference and part of his announcement is to say that Peggy has joined his administrative office. In other words, he found a way to be with her right under everyone’s nose. Randy pays her a visit and wishes her the best. He appointed Teddy to the mayoral spot thinking it would help him right some wrongs and walk a better path. Obviously that backfired. Gunnar and Scarlett take the stage at Deacon’s party and perform in the presence of country music greatness- Dan Auerbach (The Black Keys), Vince Gill, Pam Tillis, Kate York and Kip Moore. Avery arrives while they are performing and is turned away at the door. Rayna also stays far away from the party. At least at first, then she decides to get on with her life and goes to the party with Mr. White. Rayna tells Juliette she’d like to sing a song and she kind of shrugs the idea off with a “we’ll see”. Rayna eventually does take the stage with Mr. White and the celeb round up to dedicate a song to Deacon. The two of them later chat and she is clearly upset about the situation that she’s in. Deacon goes home and finds Emily on his doorstep. She has a huge box and inside of it is a birthday gift from Juliette. It’s a dog. Teddy requests Coleman to come to his office and he rassures him that he would never ask him to take sides. Instead he offers him the job as deputy mayor. They shake and Coleman is thrilled with the offer. Scarlett is a wreck and was up all night worrying about Gunnar. He finally comes home a mess because Jason was found beaten to death in an alley. Scarlett kisses him and you’ll have to wait until next week to see how far things go!